please take a moment to familiarize yourself with your partner, Novochem Trading and Service Co. Ltd.
Our company has got a 60 years old history in the chemical sector of Hungary. It has gone through many changes – its profile remained however the same including trading and distribution of various chemicals. With a capital of EUR 10 million, a yearly turnover exceeding EUR 83 million and 100% owned by Overlack AG., a German chemical distributor with 14 offices all over the world, Novochem is one of the largest traders and distributors of the Hungarian chemical industry. Our product range consisting of commodities (organic and inorganic chemicals) as well as specialities, we can statisfy all demands in the following sales segments: petrochemical, pharmaceutical, automotive, agrochemical, food&feed, construction, textile, paint and coating, household and cosmetics. We have hundreds of suppliers and customers all over Europe. We sell directly from our warehouses and have considerable expertise in handling and storing chemicals. 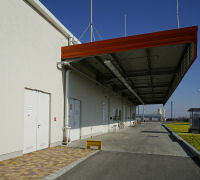 Our center warehouse is top level in SEVESO, a certified safe storage for hazardous materials. Our products are delivered in storage tanks, IBCs and barrels compliant to the strictest environmental requirements. Novochem has been granted with the Management System Certificate ISO 9001:2008 and entitled to use the brand Responsible Care initiated by CEFIC the European Chemical Industry Council. There is more to success than profiles, volumes and connections. Novochem's success would not have been possible without a well-trained and motivated staff—a proverbial team whose members commit their special knowledge and expertise on a daily basis to statisfy your special needs. Our partners do not really need to find us – we are everywhere. And now, hopefully, a step closer to you.